The three-month old puppy, named Kunxun, is the clone of a seven-year-old female police sniffer called Huahuangma. The Kunming wolfdog, deployed in Pu'er in China's south-western Yunnan province was recognised as a first-class meritorious dog in 2016 by the Ministry of Public Service for her work on murder cases, the state-owned Global Times newspaper reported. Kunxun, cloned by the Beijing-based Sinogene Biotechnology Company and the Yunnan Agricultural University, was born on December 19, 2018, and is now receiving training. 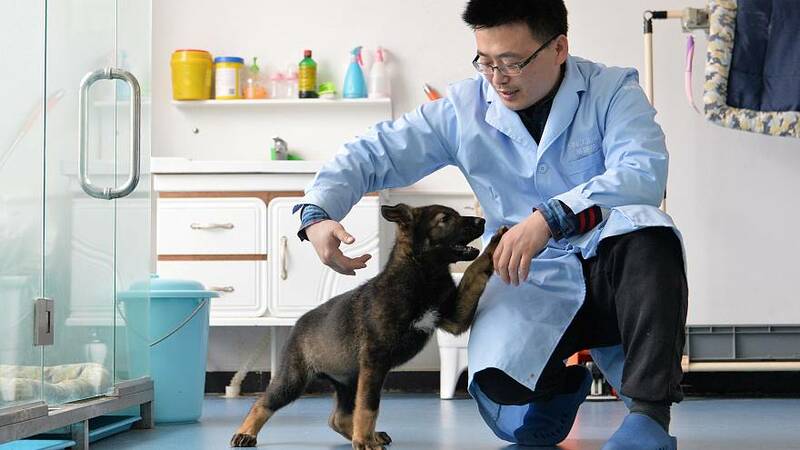 The company's deputy general manager Zhao Jianping told Global Times that they're hoping to achieve "volume production" of such dogs, which they believe will require much less time to train and also ensure a lower drop-out rate. He added however that the cost of cloning remains an issue and did not reveal how much was spent for Kunxun. A researcher at the Kunming Dog Base of Public Security, Wan Jiusheng, is also quoted as saying that Kunxun should be able to integrate police forces at just ten-months-old. According to the US National Police Dog Foundation, the youngest age when dogs become mature enough to concentrate on training well is between 12 and 15 months, they then work for five to six years and retire at about 10-years old. Wan also said that the country is building a repository of cells of other top police dogs breed for future use. South Korean scientists created the world's first cloned dog in 2005 and has since employed cloned Labrador retrievers to sniff out rugs and assist customs officers, China Daily reported.